Few people know that during the Stone Age, dozens of temples were erected in the Mediterranean islands of Malta and Gozo, all in the same style and largely according to the same unique ground plan. 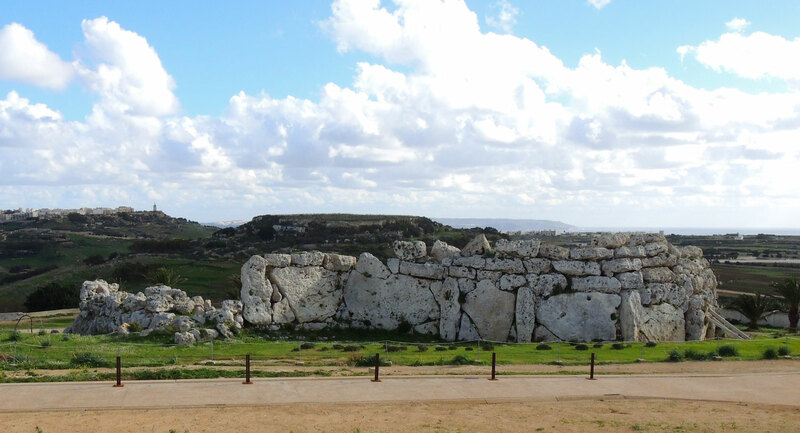 It’s our pleasure to welcome Lenie Reedijk, Author of the Month for February, who uncovers revolutionary implications for the antiquity of the hitherto misunderstood megalithic sites in Malta in Sirius: Star of the Maltese Temples. I first set foot on the Maltese islands in January 1990. What was planned to be just a winter break of a few weeks would turn out to be an encounter with the passion of a lifetime. Like almost everyone else who first lands in Malta, I was ignorant of its prehistoric temples. I visited Valletta, walked down Republic Street and passed the Museum of Archaeology. In those days there were show windows near the entrance. In them the goddess statues from the temples were on display and they could be seen from the street, as if they were placed there to invite the public to visit the museum. It certainly did the trick for me. They lured me inside… and I haven’t been the same since. 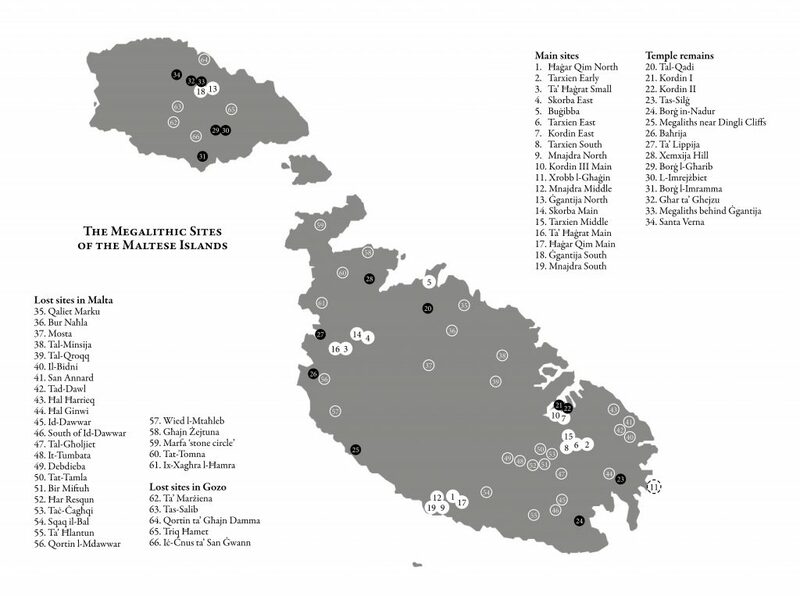 Map of the recorded megalithic sites on the Maltese islands based on John D. Evans, The Prehsitoric Antiquities of the Maltese Islands: A Survey (London, 1971). In 2015, a new temple was discovered by Ruben Paul Borg on the already known site of Xrobb l-Ghagin by means of ground penetrating radar. It is likely that with more systematic research of this kind even more temples will be found. Most of the ruins were still freely accessible. The famous larger temples of Ħaġar Qim, Mnajdra, Tarxien, Borġ in-Nadur, Ta Ħaġrat, Skorba and Ġgantija lay in the open. Today these sites are managed by Heritage Malta and stand behind fences or under protective tents, while, with the exception of Kordin, the dozens of minor sites presumably deemed unexploitable for tourism have been left lying derelict and unprotected at the mercy of the vagaries of weather and human caprice. However, as we will see, this large number of megalithic sites will turn out to be of far greater importance than their neglected and scorned state would suggest. 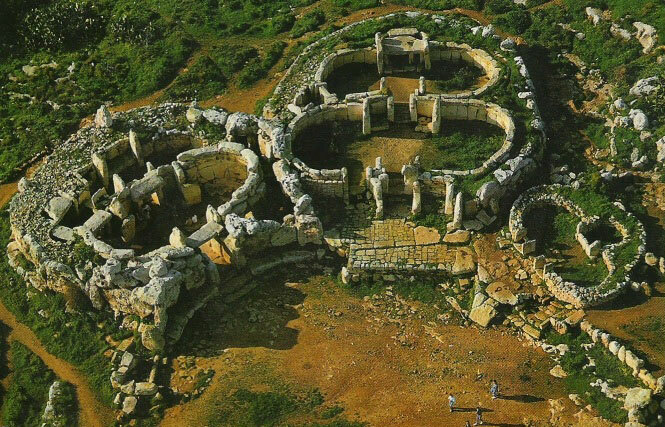 In fact, they will prove to be key to solving the mystery the Maltese temples have posed ever since their discovery. 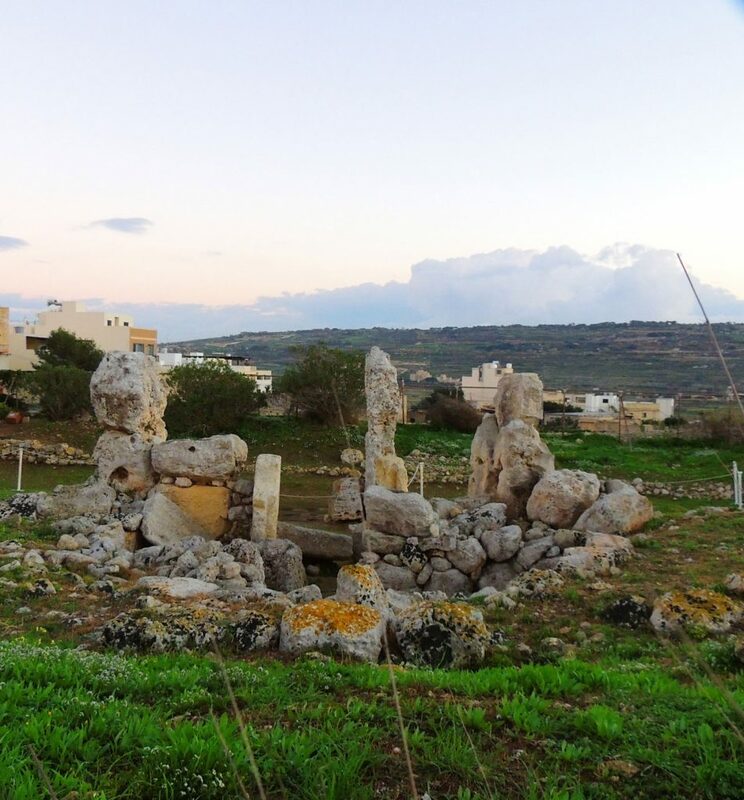 Even today, most of the megalithic remains can still be found, as they often lie outside the perimeters of the urban sprawl which has devoured much of Malta’s once rural landscape. 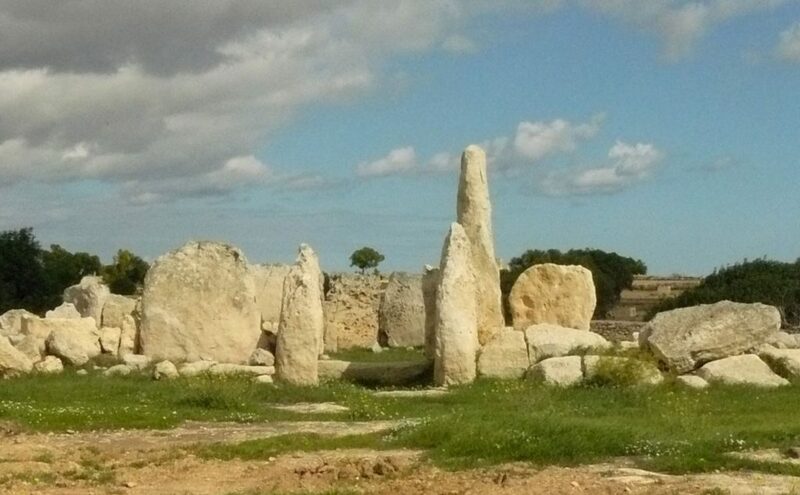 With the exception of the Tarxien temples, the Buġibba ruin and the Qala stone, a visit to the temple sites will include a country walk, and the reward is a panoramic view from their portals towards the horizon, wherever it is unobstructed. There is no predictable pattern in the distribution of the sites. They can be found exposed on hilltops or squatting in the recess of a slope; at the edge of a cliff or poised in the expanse of an open plain. Temples have been built all over the main islands of Malta and Gozo. Only the low-lying islet of Comino seems to be devoid of them. Their state of preservation ranges from an imposing ensemble of megalithic architecture to a derelict scatter of slabs or just a single remaining stone. Yet what all of these mysterious places share in common is their visible antiquity, their unique design, the style of their decorative interior artwork and their ground plan, when this has been preserved. But why were they built, and why so many? What was the purpose of this exuberant megalithic undertaking? 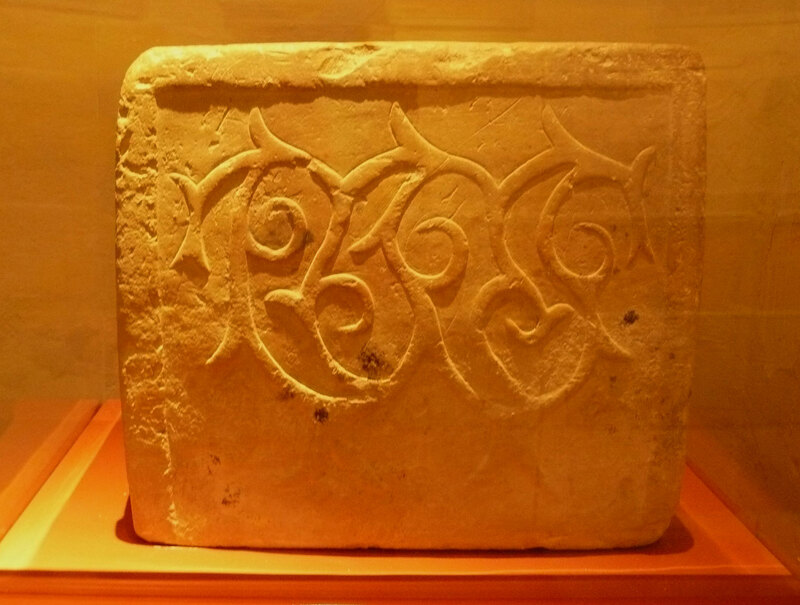 In obvious reference to present-day Maltese religious passions, conventional archaeology—not devoid of a whiff of condescension—puts the Maltese megalithic phenomenon down to a religious craze. The Maltese temples present another question. Despite the fact that they were all built according to the same typical clover-lead ground plan, and that their natural decorations and figurative art appear to derive from a single, homogenous culture, why are no two of them oriented towards the same direction? How Old Are the Temples? Unbeknown to most of us,ii the question of the antiquity of the Maltese temples has been the subject of wilful manipulation ever since Arthur Evans set foot on Malta in 1897, a few years prior to the start of his excavations at the extensive site at Knossos in Crete, dubbed by him a ‘Palace’. From that ominous year onward, the Maltese megalithic phenomenon ceased to be valued in its own right but was bound up with a project induced by a Social Darwinist quest for finding the roots—the ‘cradle’—of European civilisation. This being a predominantly British preoccupation,iii the roots of Europe, its cradle, would need to show characteristics similar to those of their own society, but in a primitive stage. It would have to depict a hierarchically structured, seafaring, fledgling expansionist nation on the brink of evolving into the stage of classical Greece. Situated on Greece’s doorstep, Crete was chosen to be this primordial place. And as the excavations and reconstruction of the Knossos site progressed, the precious title of ‘Cradle of European Civilisation’ was attached to it. Because this title was denied to Maltaiv—the only obvious rival to this position—the Maltese temples were given a date which was deliberately fashioned to be not older than the Cretan Bronze Age. Ugolini was active in Malta in the early nineteen thirties, working entirely independently of the British dominated archaeological scene in the islands. 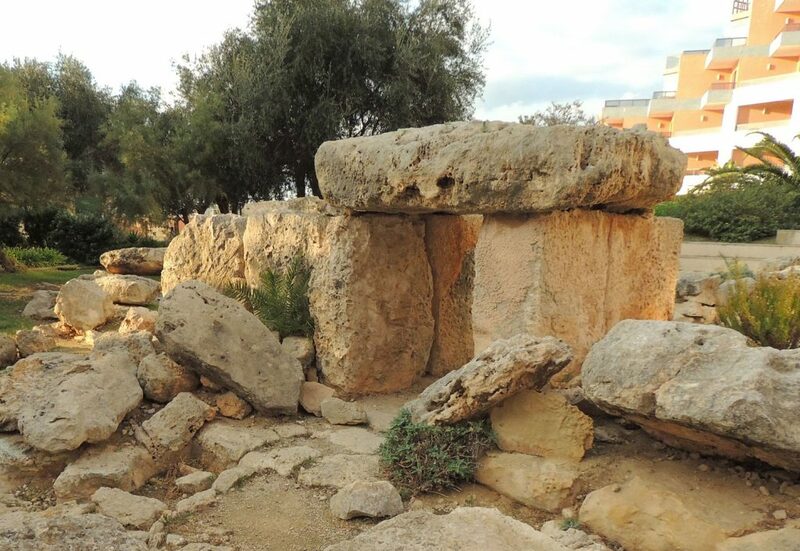 Having received no permit to conduct excavations himself, his work in Malta relied upon the guidance and goodwill shown to him by his Maltese colleague Temi Zammit, the excavator of the recently discovered megalithic site of Tarxien. 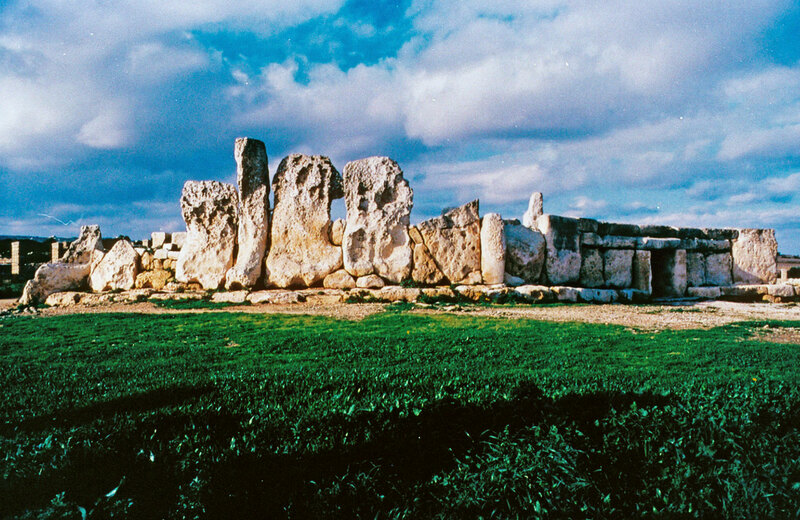 Based on Zammit’s work and on his own expertise, Ugolini and his team produced a comprehensive survey of all the megalithic sites known at the time, detailing their cultural accomplishments and architectural grandeur. He did not hesitate to ascribe to them the word civilisation, fully aware of its provocative force, and he compiled the material to prove it. Five large volumes were planned to appear on Malta’s temples, only the first of which had been published before Ugolini’s untimely death in 1936. Its very title Malta: origini della civiltà Mediterranea (Malta: Origins of Mediterranean Civilisation)vii would have sounded like blasphemy to the propagators of the Cretan cause. 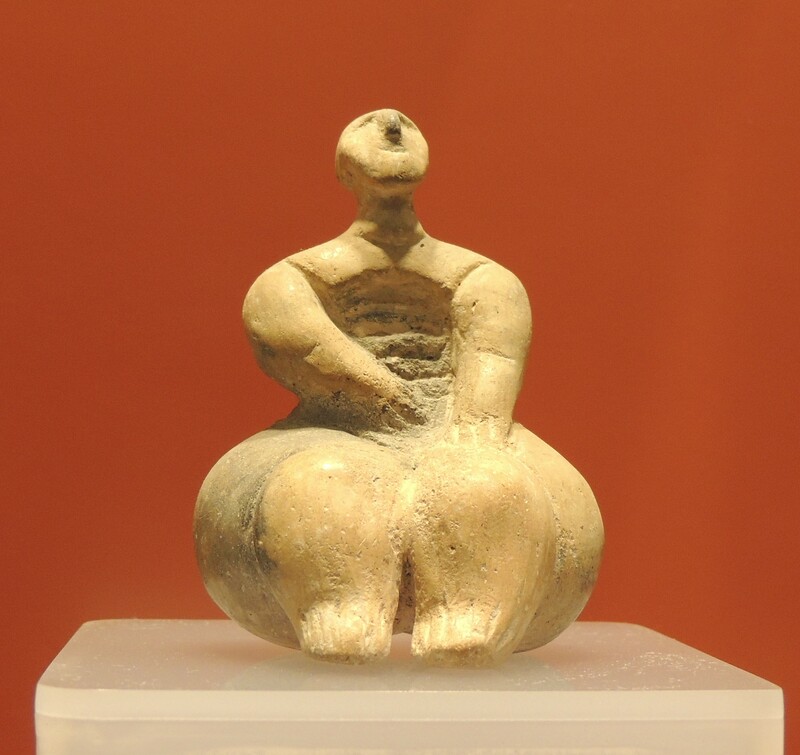 The date proposed – 8,000 BC for the oldest layer of Tarxien – turned their dismay into contentiousness. It obviously and totally contradicted the version of European cultural history propagated by the British. The opposition to Ugolini came in two waves. The immediate reaction was strong criticism of his book in the British press. Then, after World War II, far more drastic action was taken. Comprehensive amendments to Malta’s prehistoric timeline were asserted, which, to an innocent public, apparently bore no relation to Ugolini’s work, which was either ignored or dismissed as fascist propaganda unworthy of consideration. This is evident from surviving correspondence among those who pulled the strings in archaeological circles in the post-war years.viii Ugolini was dead, and his findings were buried with him. These new dates made the temples older than Crete, but this inconvenience was got around by declaring that Malta was an isolated phenomenon. The word ‘insularity’ in relation to Malta’s early prehistory, with all its desired connotations, became very popular all of a sudden.x During the decades following World War II, when coffee table books appeared illustrating Europe’s cultural history for the benefit of a public on the threshold of becoming integrated into a union, Malta invariably received a secondary place, after Crete—if it was mentioned at all. In accordance with this policy, to this day there is not a single exhibit from the Maltese temples on display in the British Museum. 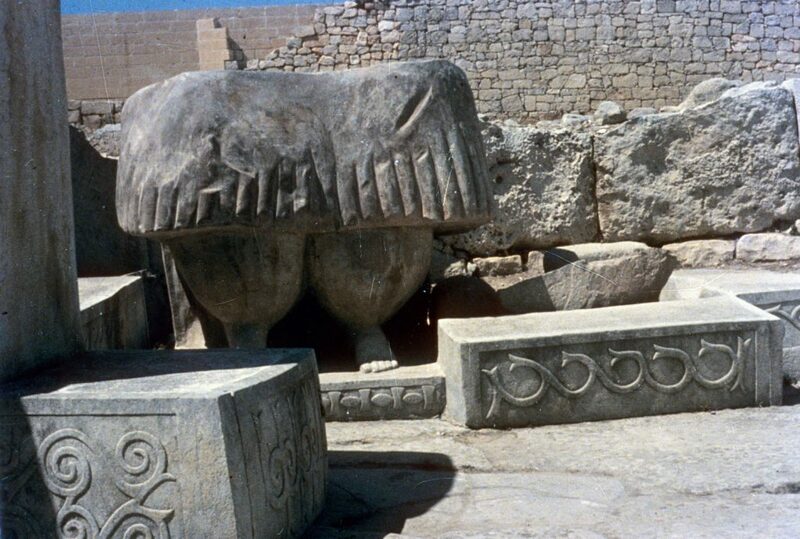 Malta’s great temple ruins had been effectively denied their rightful place and pushed out of the perceived mainstream of human cultural history. This was the setting when, in the wake of the groundbreaking work by Alexander Thom on the astronomy of the megalithic sites in Britain, similar investigations started in Malta too. George Agius and Frank Ventura, lecturers at the University of Malta, were the very first to securely measure the orientations of all the megalithic temples whose regular ground plans were either known or still extant. Altogether nineteen temples could be included. 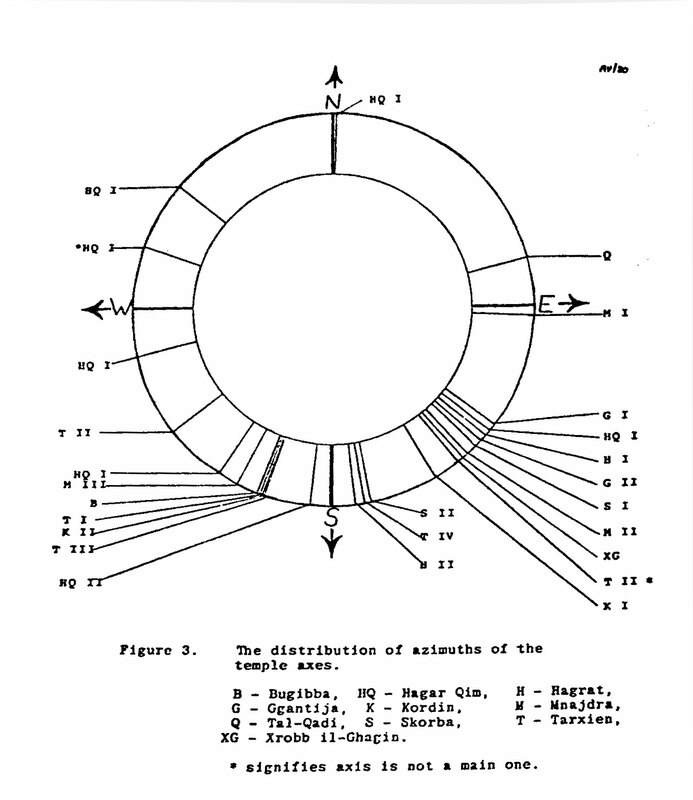 Their first article, ‘Investigations into the Possible Astronomical Alignments of the Copper Age Temples in Malta,’xi published in 1980, is interesting in several respects. They accurately established the azimuths, which means the compass directions, of all the temple axes of which the regular ground plan was known, and they came to the interesting conclusion that the distribution of their orientations was not random and that it had not happened by chance. Some mechanism must have been the driving force behind the peculiar pattern of temple orientations. How could these two clear patterns on either side of due south be explained? The answer is yes, there was one, and it was one that could not have been more befitting of the majesty of the Maltese temples in their Mediterranean setting. Before we get into the details and implications of this result, we must get acquainted with a mechanism, a movement in the sky, which is well known to astronomers and appears to be crucial in explaining not only the shift in the temple orientations, but also the large number of temples in Malta. 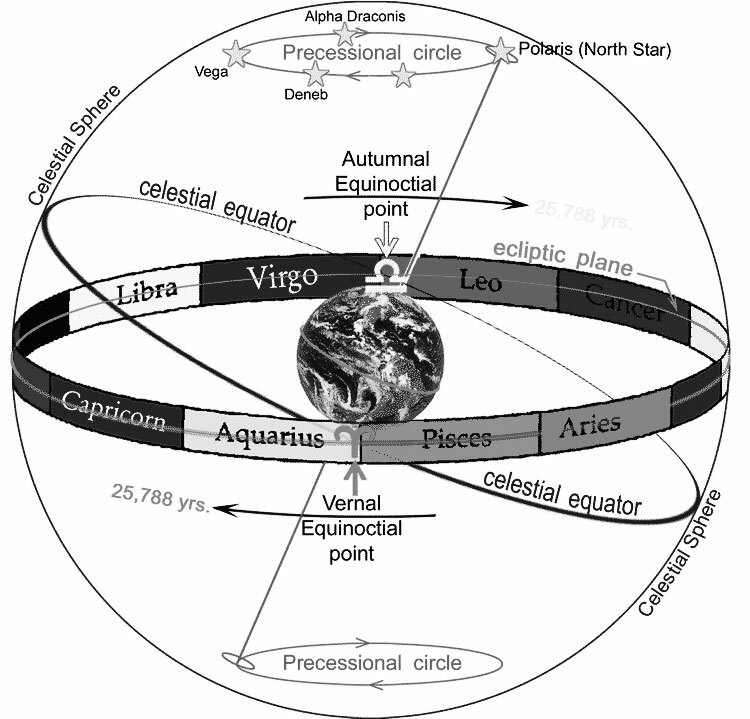 It is ‘precession’ or ‘precession of the equinoxes,’ which I will briefly explain with the aid of pictures. The axis of the Earth is tilted in relation to the plane of the ecliptic. Moreover, the axis is not stable. It moves around in a circular motion which can be compared to the wobble of a spinning top. This movement is so slow that it takes about 26,000 years to complete one round, and it can hardly be noticed in a lifetime, making a shift of only one degree in 70 years. The effect of precession can be noticed in three ways. 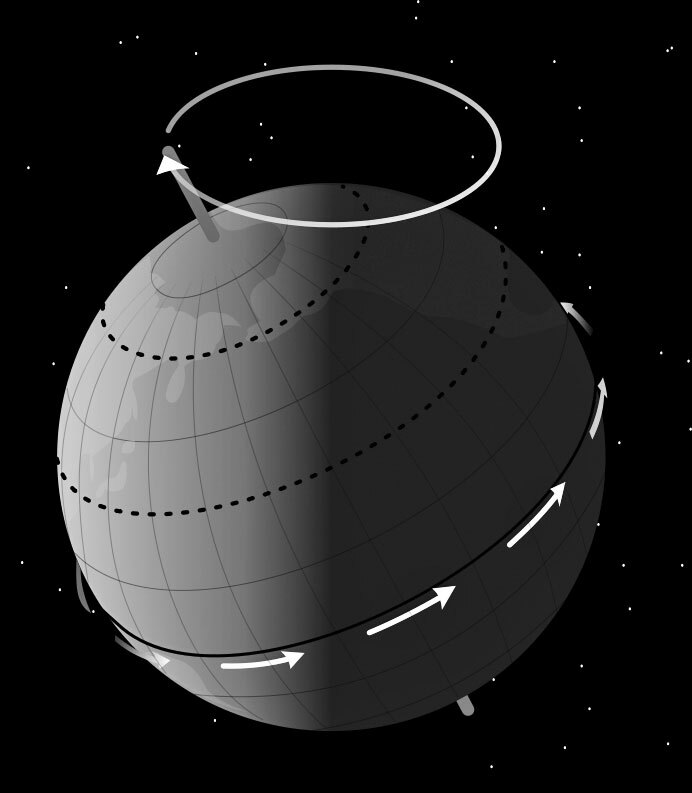 One: the pole shifts through the circle of circumpolar stars. Two: the constellations beyond the sun at its rising position at the vernal and autumnal equinoctial points change over this long period. Three: the rising and setting points of the stars themselves slowly shift along the horizon. Stars that had once been outside the field of view as seen from a specific point on Earth would eventually move into sight again after some time. Owing to the slow northward motion of the vault of the sky caused by precession, in around 9,400 BC, a viewer who stood on the south coast of Malta and looked in a southerly direction would behold an unusual sight. A star appeared in the sky of a brilliance never seen before. It was Sirius. For viewers at Malta’s latitude, Sirius had been invisible for five thousand years before that date. Now it came into view again in all its splendour, and over the years the time of its visibility in the night sky grew gradually longer. The ideal location from which to watch this delightful phenomenon was the site now called Ħaġar Qim. And it was precisely here that the very first temple, an observatory to the star Sirius, was built. 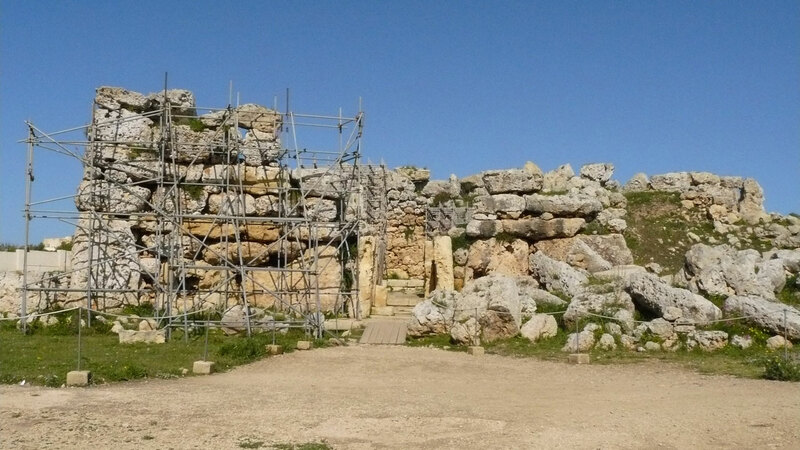 This is the ruin now referred to as Ħaġar Qim North, which is one of the smallest temples lying neglected behind the main temple, inaccessible to visitors. We can still see today that it once overlooked the sea in a direction slightly west of south, with an azimuth of 186 degrees. According to the date deduced from the precession of Sirius,xii it was built in around 9,150 BC. Thus we have established that the Maltese temple period lasted nearly five thousand years. Within this timeframe, they could have built a temple every two centuries according to both the rising and setting of the star. This is precisely the time at which Sirius would have moved out of the line of sight of an existing temple, and another temple would be needed, explaining the shift in temple orientations most satisfactorily. Is this too long a time period? If we consider that the civilisation of ancient Egypt lasted for at least four thousand years, and that Christianity is already two thousand years old, a life span of several millennia is common for civilisations. The outcome given here also points to an organic and gradual increase in the size of the buildings themselves. 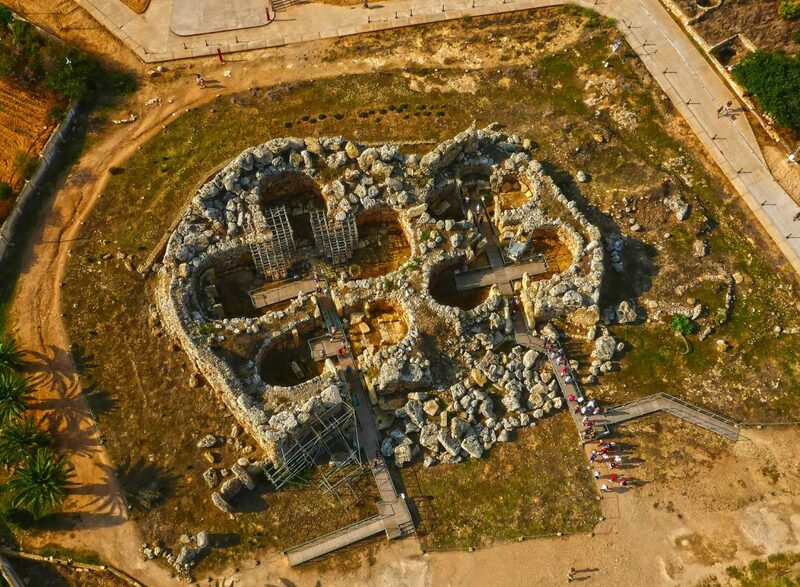 Ħaġar Qim North, the oldest from the astronomical perspective, has a very small footprint, whereas Ġgantija South, the youngest and last to have been built, is also the most gigantic. And what is the antiquity of Tarxien in our new timeline? 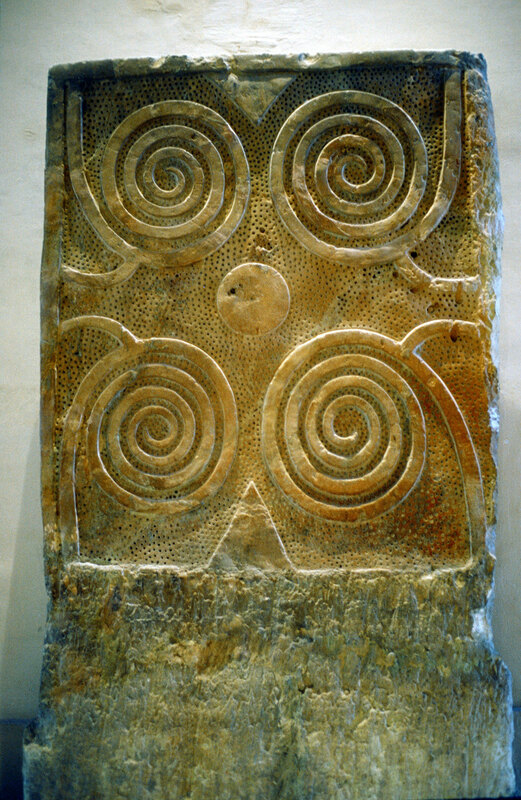 Tarxien East receives a date of 8,550 BC and Tarxien South of 8,300 BC. Luigi Ugolini, the vilified Italian, had been right all along. In fact he was spot on. This astonishing outcome of the astronomical purpose and meaning of the Maltese temples provides plenty of food for thought. 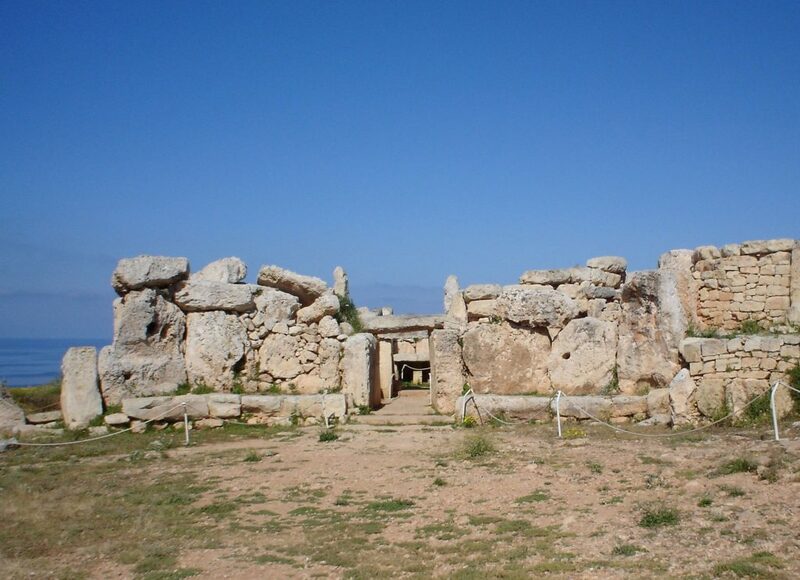 This great megalithic culture in the middle of the Mediterranean appears to have started immediately after the last Ice Age and ended when the civilisation of ancient Egypt arose. Moreover, its beginning would have been contemporaneous with another great enterprise, the temple building at the famous site of Göbekli Tepe in southeast Turkey, as well as with the single megalithic stone, which was recently found at the bottom of the Mediterranean between Pantelleria and Sicily, at a depth that points to the same period when building started in Malta. It would seem that there has never been a cultural void during the Mesolithic. On the contrary, there must have been a very vibrant building culture over an extensive area in and around the Mediterranean, of people who were both interested in and knowledgeable about the movements of the stars. Was civilisation started by astronomers and not by farmers? 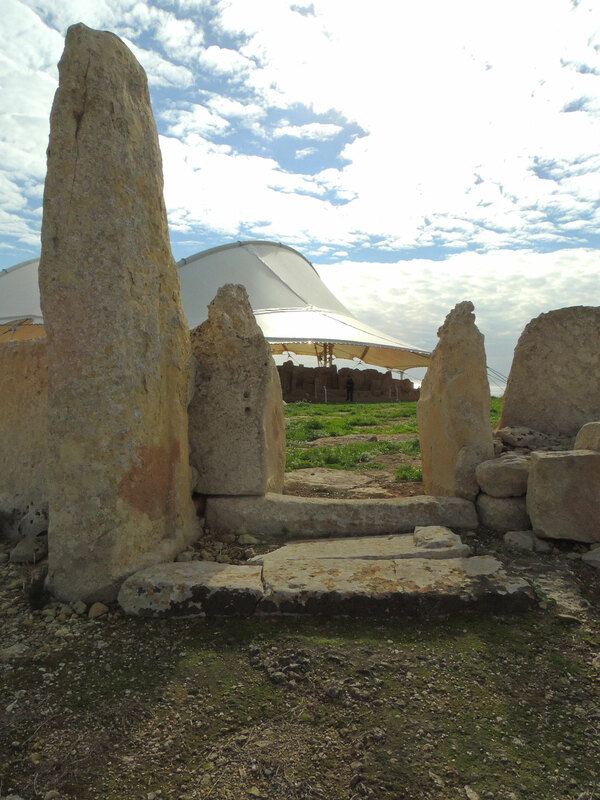 A fresh look at Malta’s megalithic temples seems to point strongly in that direction, with exciting consequences for our thoughts about the roots of human civilisation. i See John D. Evans, The Prehistoric Antiquities of the Maltese Islands, London 1971.
ii It is little known that Arthur Evans visited Malta at all. His opinions even influenced German researcher Albert Mayr, who conducted the first survey of the megalithic sites, Die Vorgeschichtlichen Denkmäler Maltas, published in 1901.
iii See Lenie Reedijk, Sirius, the Star of the Maltese Temples, MaletBooks 2018 (hereafter: SSMT), Part One, Ch. 6: ‘The Legacy of the X Club’. iv In the Maltese temples several artefacts (figurines, pottery pieces) showed artistic links to Africa, of which Arthur Evans had been well aware. This, too, will have played a role, because a European cradle so close to Africa would have been unwanted. Moreover, in these sites in Malta no weapons had ever been found. A peaceful culture showing no signs of warfare would not make an ideal ‘cradle’ for a Western society based on expansionism and military bravado. 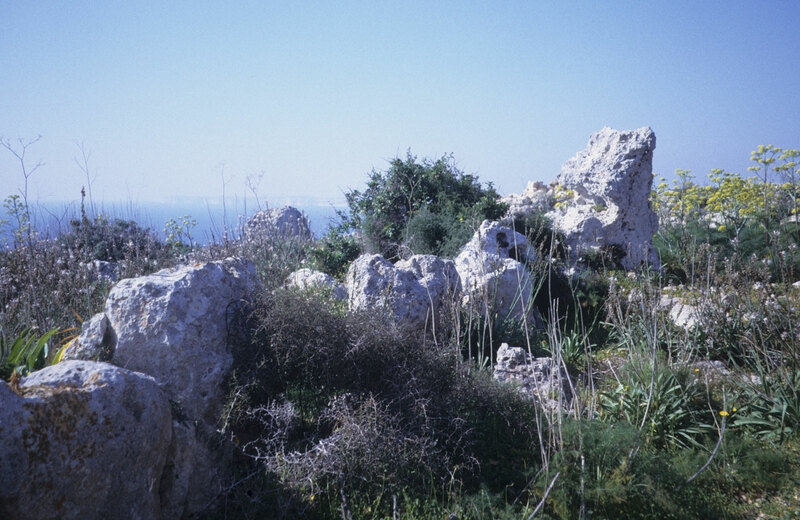 vi In the early 1990s, two Dutch researchers were harassed by the Maltese authorities while doing a splendid job trying to prevent a temple period settlement site from being destroyed by housing development. See SSMT, p. 57. Shortly thereafter, when Maltese medical doctor Anton Mifsud published his Dossier Malta (Malta 1997), a storm of criticism ensued. In it he revealed that Palaeolithic human teeth from Malta had been tampered with to ‘prove’ a Neolithic age for them (SSMT, p. 58). vii There are plans to publish all of Ugolini’s works in the Italian original with English translations. viii See SSMT, Ch. 5, ‘Ugolini – A Colloquy’ , p. 72.
ix Graham Hancock, in his classic Underworld: Flooded Kingdoms of the Ice Age (2002), devoted over a hundred pages to these problems in Malta. It makes compelling reading for those who are interested in and concerned about Malta’s important megalithic legacy. x To quote only two example of many: ‘Megalithic architecture in Malta is an indigenous phenomenon, and its origins and function must be sought in a purely local context …’, and ‘There is here little to imply connections with megalithic sites elsewhere, whether funerary, astronomical or religious…’, from David Trump, ‘Megalithic Architecture in Malta’, in: Antiquity and Man, ed, by John D. Evans et al., London 1981, p. 128 and 135.
xi G. Agius and F. Ventura, Investigations into the Possible Astronomical Alignments of the Copper Age Temples in Malta, Monograph, Malta University Press, 1980.
xii The sky programmes used were CyberSky from Microsoft and Stellarium. xiii For all the dates of the temples resulting from the precession of Sirius I would like refer to the graph at the back of my book. This not only shows a fairly regular distribution of the dates of construction of the 18 temples included, for it also leaves room for all the other temples of which no ground plan–and thus no measurable azimuth–has remained. Thank you to David Gahan for his continuous support of this important project. Born in the Netherlands, Lenie Reedijk is a juridical translator by profession. She studied English at the University of Utrecht and German language and literature in Amsterdam and Berlin. 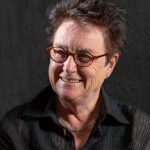 In Berlin she participated as a translator in a book project on Maltese literature, Literatur aus Malta (1989), which brought her to the islands the following year. She lived in Malta from 1990 to 1996, working as an interpreter. During this period her interest in Malta’s ancient temple ruins was awakened. 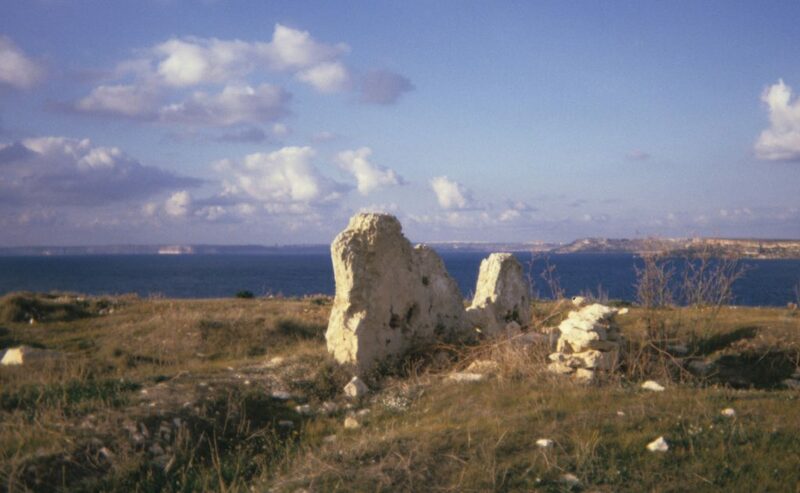 Lenie Reedijk is the author of Archaeological Walks on Gozo (MaletBooks 2009). 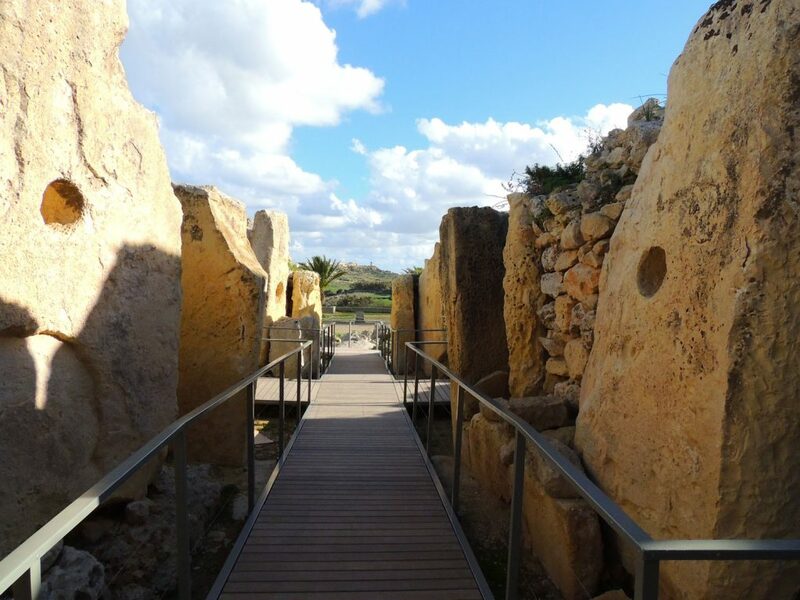 She has given talks and seminars on Malta’s megalithic temple culture in the Netherlands, Germany and Gozo, and has conducted tours especially designed to see all the accessible ancient sites. She subsequently embarked on the project to try to solve the many questions surrounding this enigmatic civilisation. 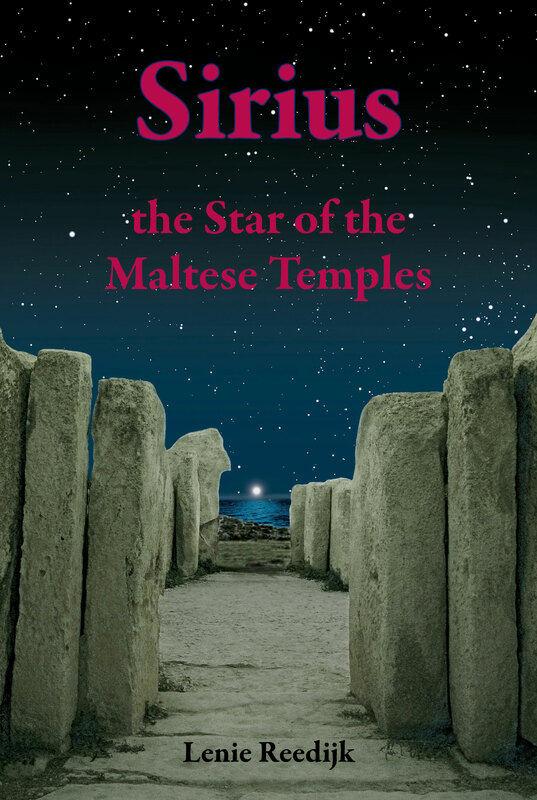 It resulted in the book Sirius, the Star of the Maltese Temples (MaletBooks 2018), which reveals that the discovery of the orientation of the temples to Sirius presents the answer to the most important questions. 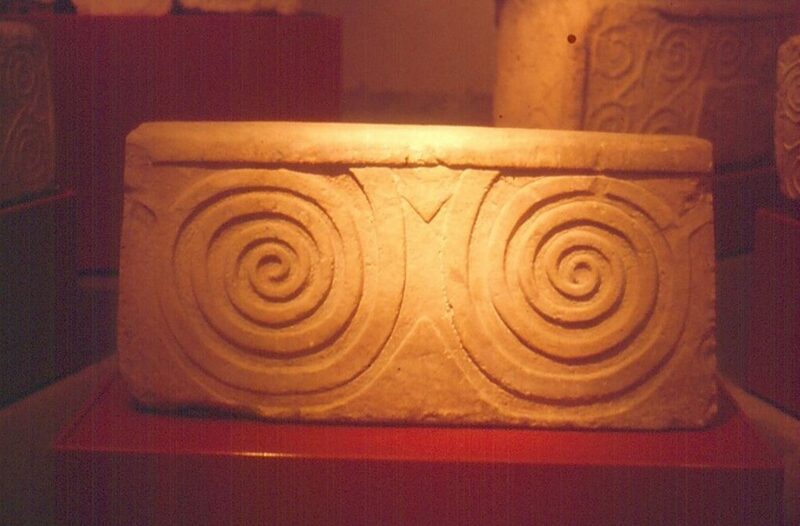 It also uncovers manoeuvrings that have taken place in Maltese archaeology in the past, which caused Malta’s temple culture to remain practically unknown to the public at large. Great article and pictures. You probably are already aware of this, but I see an immediate connection to Newgrange in Ireland. Those spirals sure look similar to the spirals on the kerbstones there. Conventional archeology dates Newgrange to around 3200 bc, but I’ve read some things that indicate it could be significantly older and likely similar in age to the megalithic construction in Malta. Keep working on it. Someday we may know who these people were who were travelling the globe some 10 to 12000 years ago. Thank you for your encouraging words, Greg. I agree with you that the spirals on megalithic buildings are an indication that they could be related. If only we could read their symbolism. Is it solar? I believe that Sirius may well have been a part of ‘what went on’ there in those amazing sites. Though after years of visits and personal research, I strongly believe there is much more involved, in the ‘decoding’ and understanding of these enigmatic and certainly most delightful ruins. i: Lunar & Solar eclipses and other measurements, which have been shown to have been of great importance to the wise and learned users of there places. ii: Acoustics and the effects on the brain and other arcane practices and disciplines, were almost certainly part of the ‘reason’ the temples were built and used. Thank you for your work, as it adds yet more color to the tapestry of understanding, involved around and beyond the ruins of Malta. I look forward to any further resultss, thoughts, revelations and insights you offer. Thank you for your kind words, James. 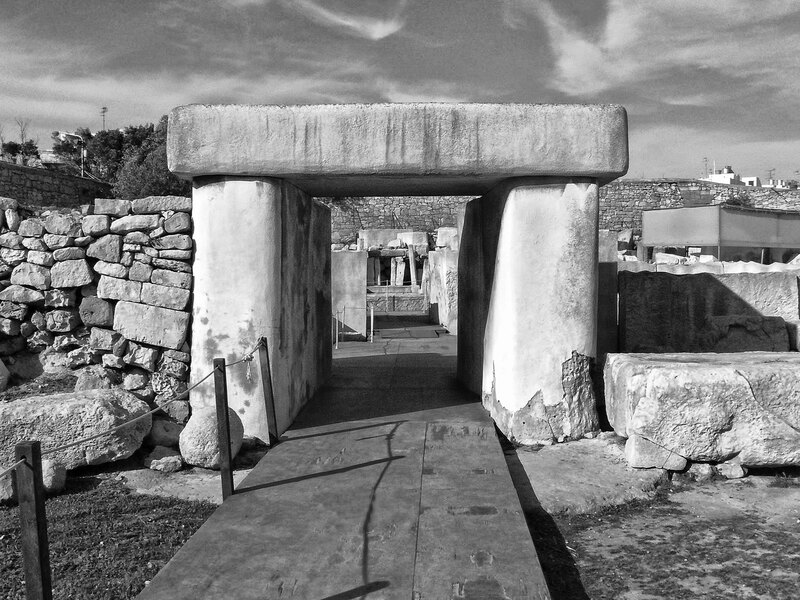 The great and complex megalithic buildings in the Maltese islands were almost certainly places in which rituals took place revolving around sound and light effects. You are probably acquainted with the interesting work by Paul Devereux on the acoustics in the Hypogeum? I am aware that more alignments have been discovered, more especially to the rising and setting sun of the summer solstice. I plan to incorporate these in a future sequel to my Sirius book. These additional alignments do not concern any of the main axes of the temples, but are to be found in the side chapels of Hagar Qim. Wonderful, enlightening article. Thank you so much. Graham, that is an astonishing analysis on Maltese Temples configuration in relation to stars, but only few people did it. Was it ever corroborated with any major figures in astronomy field? I think I have some extra material for that matter. @Andrew : I personally am interested on what you just said, temples are not about the stars. Can you explain, please ? @Andrew, I’m interested at what you just posted about Maltese temples. Can you explain ? What I like most about your hypothesis is that it’s falsifiable. If you are correct, there should be no material at the sites which dates as older than the the time when that site’s temple aligned with Sirius. Also, it rains on Malta, so if you are correct (and if they used the same type of rock over the millenia), the age predicted by alignment with sirius should overlay with the age as predicted by weathering. An interesting exercise would be to employ a legitimate artist who is unfamiliar with these ruins. If you provided them with photos of the art they should be able to rank them chronologically, and that would give you a qualitative (but subjective) measure of relative age. Good work, and thank you for writing this. In my opinion based on scientific research, the Mnajdra lower temple is also aligned with the sun and the different phases of the moon. The positioning of the stones indicate alignments along the summer solstice, winter solstice, equinoxes as well as cross quarter and eight days. This is after work conducted by Paul I Micallef, Prof Maelee Thomson and myself. Hello Chris, Of course I know your and your father’s important work on the Mnajdra-South temple. In fact I refer to it extensively in my book, which you seem not to have read? It’s available in all the bookshops in Malta. If you like to read it, I could also present you with a copy, since your work features in my book. You find the contact form to get in touch with me on the website http://www.sirius-malta.com. This makes me happy, I visited quite a few of them a few years back and left deeply disatisfied with the anthropological explanations, none of it felt that young, the figurines and statues talked of a previous epoch. Grahams work helped scratch that itch to a certain extent but almost left me with more questions than I started with. I really look forward to devouring your book. 4,900 years! I wander if they migrated or were assimilated in the bronze age takeover and if they migrated where did they go? Did their skill in moving stone influence Egypt and the Levant? So many questions! @ Josh Pullman. The impressions you describe after visiting the temples reflect the experience of many. I look forward to your response after reading my book. Wonderful summary of a fascinating book. In Lenie’s book, the influence of social Darwinism on the interpretation of Malta’s temples is thoroughly described. Her book answered many questions for me. Sirius, the sun, the cross-quarter days–what an amazing wealth of tradition and knowledge is hidden in broad daylight (or under a tent). Thank you, Lenie. 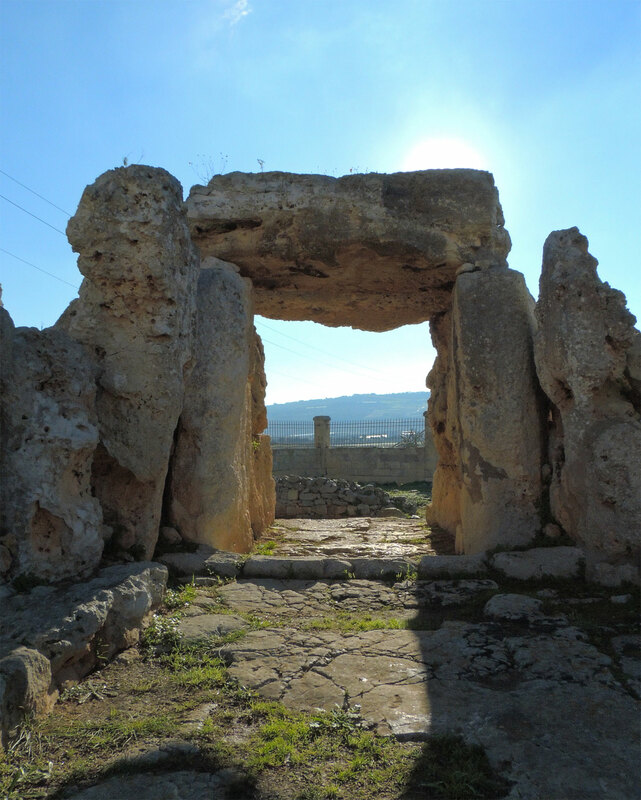 We are looking forward to watching the spring equinox sunrise lighting up the passageway at Mnajdra this year. Your will find that date mentioned in the Conclusions. I will give you the exact page number when I have access to the book. That’s fine ,Lenie, I can look over it one more time. The main concern is the fact that Sirius was not visible to the eye in this period. It’s page 244. If my reading of his account is correct, Ulogini is making a general assumption, that the lowest habitation layer inside Tarxien is as old as the older Neolithic boundary, yet he bases this solely by association. He argues that the (then) dates of the Neolithic were in need of revision, to between 4000-8000 BC. Of course this is an arbitrary and personal dating system. His argument supposes that if the start of the Neolithic is 8000 BC then, by association, the oldest habitation layer must also be 8000 BC. Obviously this is a very shaky ground. Personally I think he’s on the right path. However, the method behind his theory is unsound. I refer the reader to Chapters 4 and 5 of Part One of my Sirius book for an appreciation of Ugolini’s professionalism and the rectification of the sad story of the vilification of his reputation after his death. Ugolini was very professional, I wasn’t doubting that. 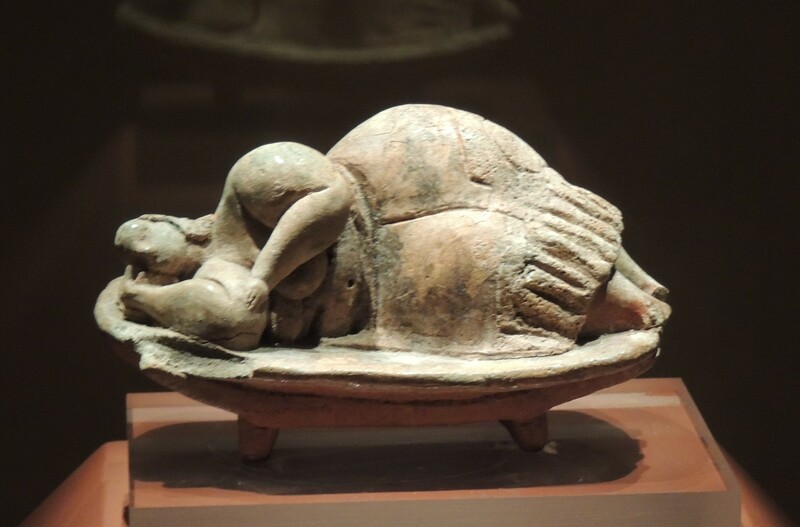 But he does not date the lowest habitation layer of Tarxien to 8000 BC directly, he is implying the date because he disagreed with the (then) official start of the Neolithic, which Ogolini pushes back to 8000 BC. So the lower habitation layer date is by association only. That was my point. To add to my previous question/post, if we analyze Sirius at Hagiar Q’em (North) c9150 BC, the star would indeed be above the horizon, as you suggest, except for one tiny problem: the Sun was still above the horizon, meaning that Sirius would not be visible to the eye. There is also a small problem with the azimuth. Even if the Sun were below the horizon, and Sirius could be seen with the naked eye, the alignment of 188 degrees would mark the descent of Sirius into the horizon. This ignores the fact that cultures worldwide never celebrated the descent of a star, they honoured its rising or highest ascendence (the setting Sun at the equinox being the only exception). For your theory to work, the azimuth of the temple to Sirius would need to be 168 -180 degrees. But still, Sirius would not have been visible because the Sun was still high in the sky. The belt of Orion would make a better fit, but again, it was not visible because of the light of the still present Sun. Would be interested in a comment on this, because I really would like this important work to be correct. I do believe the foundation of the temples of Malta date before the flood of 9700 BC, they were later restored, the signs are very obvious, and realigned to account for changes in precession. This too is evident in the different axes of the temples, Tarxien being an excellent example.The Micallefs’ work (exemplary, by the way) validates these changes, in my opinion. With regard to your work on Sirius, however, it is important the research holds up to scrutiny. From what I mention above, which anyone with Stellarium can validate, there are issues that need to be addressed. Thanks in advance for your time. This is a first for this site. My two posts have been removed after being live for three days. IS thsi because I discovered thei author’s theory to be incorrect? Have we come to the point of censorship on this website, of all places? Dear Freddy Silva, thank you for your comments. Personally I have no reason to believe that there is any form of censorship at play. I could not respond to your post of the 9th of March, because it did not appear on screen until today the 12th. I certainly intend to respond to your interesting questions in the next day or so. My posts were deleted after approval, which was odd and rare. Turns out to have been an honest mistake, that’s all. This website must be greatly commended for offering a platform for me to expand on important matters more fully, and set right any misconceptions. I will respond to some of these here as concisely as possible. 1) I quote you: “The sun was still above the horizon, meaning that Sirius would not be visible to the eye.” Without a basic knowledge of archaeo-astronomy it is impossible to interpret sky-programmes correctly. Every star in the night sky except the circumpolar stars is invisible for a certain period in the year, when it traverses the sky during the day. 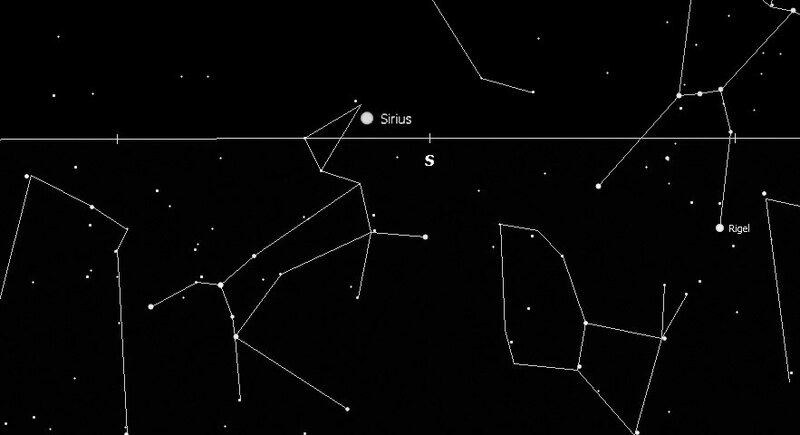 In the northern hemisphere Sirius is a winter star, and it does not appear in the night sky in summer. Today, at the latitude of the Mediterranean, its invisibility lasts for about three months. In more ancient times this period was somewhat shorter. In ancient Egypt it was 70 days. 2) Fundamental for understanding the basic principles of archaeo-astronomy is the use of the right terms. If you talk about the ‘descent’ instead of the setting of a star, you will find no mention of it anywhere in the literature. The annual day of last visibility of a star, however, was a most important observation for ancient astronomers, because the time between its heliacal setting and rising marked its period of invisibility. 3) For these obvious reasons, in ancient cultures both the rising and the setting of stars was monitored closely, and this is especially the case for the brightest of all the stars, Sirius. In ancient Egypt, for instance, the knowledge of the number of days (70) between its heliacal set and rise was deemed so important that it was made to correspond with the number of days the mummification process of a deceased pharaoh was to last before his burial. 4) The knowledge of this is crucial in order to fully appreciate the beauty of the fact that the temples of Malta were directed to both the rising and the setting of Sirius from such ancient times onwards. Thank you. I am familiar with all this (I’m not sure you know who I am, a published author and researcher of ancient civilizations). This is confusing two things: one, the measurement of time using the rising and setting of stars. That’s a given. What I’m referring to is the alignment of a temple to reference a specific event. That’s when our predecessors honoured the rising of mid-heaven position of a star, a constellation, etc. It did not have to be a heliacal rising, it could have been any time during the night. My point above is that when Sirius was briefly above the horizon at 9150 BC (as shown on Stellarium), it was not visible on Malta because the Sun was still in the sky. It was daylight. You cannot see stars in daylight. Venus, perhaps, but not stars. Don’t feel obligated a response to this, we researchers are a busy lot, but I believe I have made my case. Dear Freddy Silva, I explained the reason why you saw Sirius with your computer sky programme during daylight above: you looked at the wrong time of year. Just look at Sirius during any winter month.